David Sabrsula works on a vehicle at Community First! Car Care, a shop that employs once-homeless people. 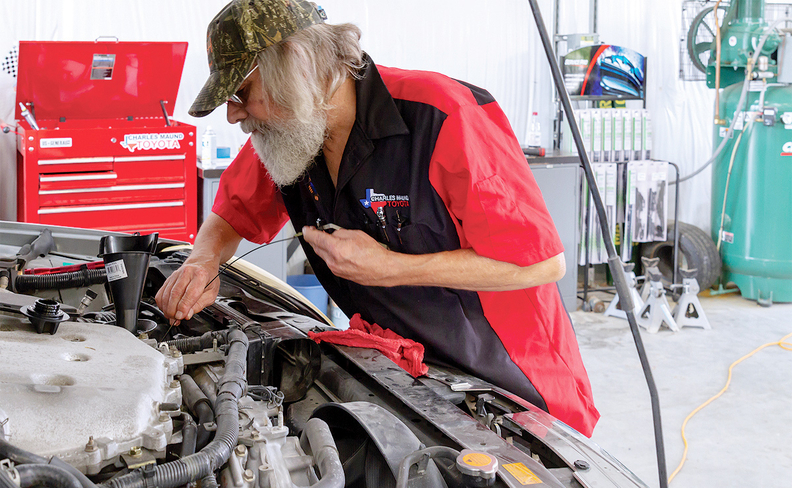 An acute and growing shortage of service technicians is pushing franchised dealerships to act creatively to develop talent. Dealerships are working with local colleges on training programs and looking for candidates among groups that have often been excluded. Charles Maund Toyota of Austin, Texas, is helping to train one of those groups: homeless people. The dealership is partnering with Community First! Village, which provides permanent housing and jobs to once-chronically homeless Austinites. Residents of the 51-acre community can find jobs at its onsite businesses, including Community First! Car Care, which opened in November. Although the dealership has offered to hire graduates of the training program as lube techs, for now the priority is enabling the trainees to operate Car Care. Charles Maund Toyota renovated a two-car garage to become the shop. It supplied lifts and tools, investing around $30,000 in the project. Rey Cantu, the dealership's assistant service manager, says the investment is paying off. "After working with the individuals [at Car Care], talking to them and seeing what they've accomplished, you see the end result and you know the program works," Cantu told Fixed Ops Journal. Community First! initially hired four residents to staff the shop. Cantu invited them to shadow service employees at Charles Maund Toyota for three weeks. Cantu and paid dealership volunteers then spent three weeks training residents at Car Care. Seven residents of the community are now qualified lube techs. Car Care operates as a nonprofit business, offering basic services such as car washes, oil changes, tire rotations and wiper blade replacement. The shop is open three days a week. Larry Crawford, the director of Community First! Car Care, says he expects to expand hours and hire more employees as the business grows. "The main goal of this micro-enterprise is to provide opportunities for residents to earn a dignified income," Crawford says. "As business picks up, we'll add hours and days so I can add more employees." The shop generally works on two to 14 vehicles a day, Crawford says. Most customers are there for the first time, he adds. Charles Maund Toyota offered to hire some Car Care employees, but Crawford has declined so far. "The No. 1 asset any small business has is their talent, and no business wants their talent to move on," Crawford said. "But if one of [the techs] does want to move on, I'll do everything to help them." One of the shop techs, Ron Dorsey, has lived at Community First! Village for a year. Dorsey, 63, says he became homeless about five years ago after he was laid off and couldn't pay his rent. He says the opportunity to train with Charles Maund Toyota has been a significant step. He doesn't plan to leave Car Care anytime soon. "The future is much brighter, much brighter," Dorsey says. "I can pay rent and save, and have a little change left over to do a few things with — like buy a vehicle." Cantu says Charles Maund Toyota remains interested in eventually hiring Community First! residents as service technicians. Meanwhile, he says, the dealership will stay involved with Car Care. Cantu says he still visits the shop frequently to order supplies, provide additional tools and help train new employees. "It's just heartwarming, and it's rewarding training" the residents, Cantu says. "You can see their transformation during training — you can see the change in attitude. "The biggest change was when we provided them with uniforms," he adds. "That gave them a big uplift. When they put that uniform on, it was like a different person. You could see the pride they had."